Today I’m part of the week long Spring Home Tour series hosted by Marty of A Stroll Thru Life. If you are coming from Marty’s, then I’m wishing you a warm welcome and thanks so much for visiting my little corner of the web. And if you aren’t new around here then I’m of course very happy to have you visit me as well. I haven’t done a lot of traditional Spring seasonal decorating this year because I had a fun photoshoot last week and couldn’t have seasonal decor in the house, but I did add touches here and there. Especially to my little desk area. 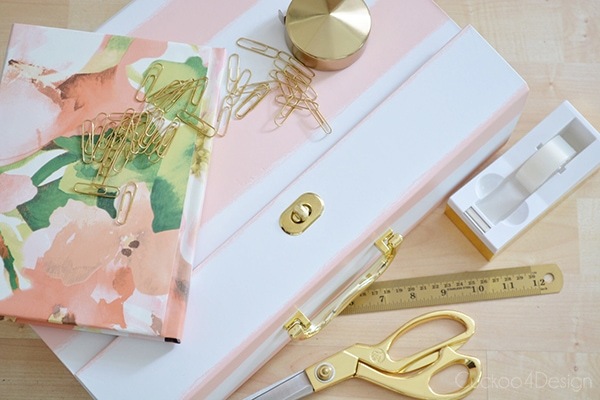 There is nothing like spring cleaning and organizing your desk to get a boost of creativity and productivity. But I also enjoyed making some flower arrangements. When the kiddos get home they do their homework here in the kitchen. Can you tell how frustrated she looks? DIY curtain video or click over to the tutorial. The acrylic box holding my business cards is actually a bathroom cottonball holder and the perfect size for business cards. You can find it HERE. The Moravian Star chandelier (or similar one HERE) was a birthday present from my husband which I wanted for the downstairs hallway but it didn’t fit. So instead of returning it, I hung it in my daughter’s bedroom. I’m a little disappointed that it’s not as gold as it appears on the Ballard Design catalog. It was previously on their front cover and a bright shiny gold. Oh well. My daughter loves it though and she really didn’t want her old one anymore. And since I recently moved the BeniO rug to the living room from our bedroom, I had to move this replica shag back into the bedroom but it works great in here too, don’t you think so? Be sure to visit Sarah of Life on Virginia Street for your next stop on todays tours. I love her house and sense of style and of course her kitties too. I love your home, so pretty and I adore the way you mix up your patterns and textures. Always a feast for the eyes. Thanks so much for a fabulous tour. HOLY WOW!!!!! your home looks the best it ever has! i love love love the blush accents, and i am dying over the simple rope around the base of your palm! my palm didn’t survive from a treacherous windblown fall this past Fall and a winter inside where I tried to revitalize…. so sad! Thank you a million times and sorry about your palm. 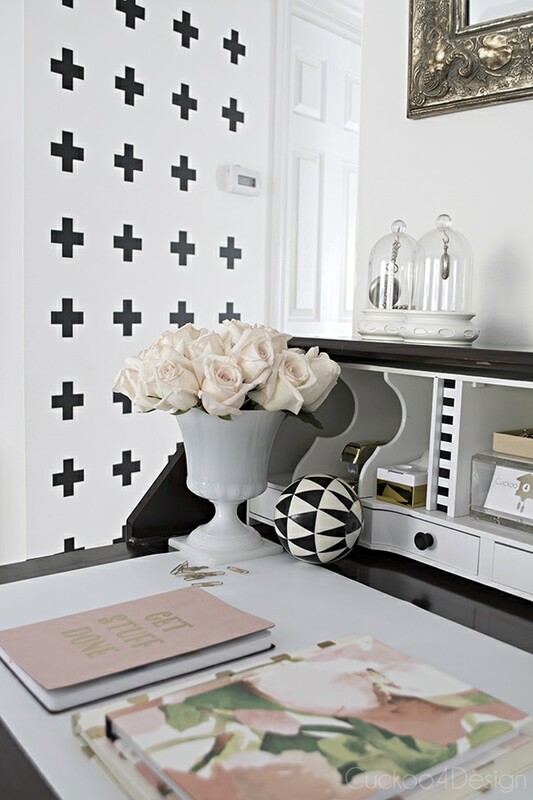 The black and white is so classic and the pops of color add a lovely springtime flair. Sparkly, Blush, and Bashful… I like the sound of that! I’m trying to convince my husband to paint my buffet dresser a very light blush. Lets see! Beautiful!!! 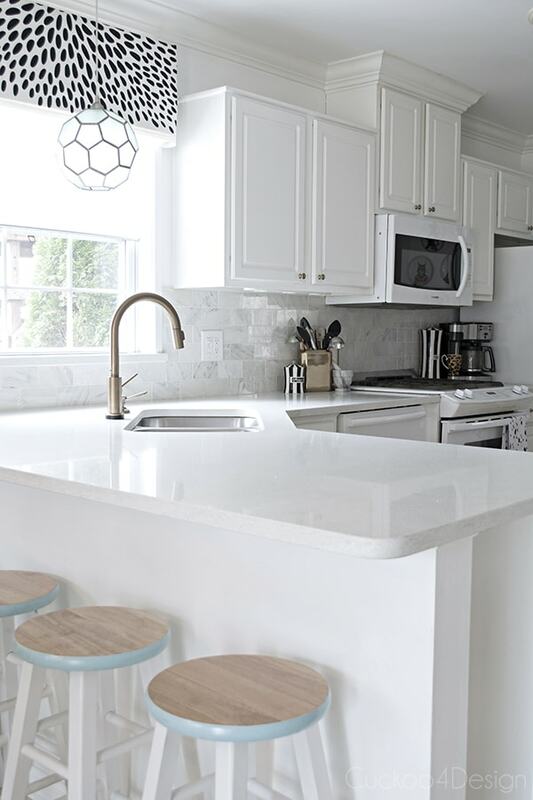 Where did you get that cool lamp over your kitchen sink? Hallo! It’s originally from Urban Outfitters but they don’t sell it anymore. I link to an almost identical cone under the photo though. It’s a little bigger. What a beautiful space! I’m visiting today for the first time and it all looks so lovely. I have to know…where did you get your cuckoo clock? Did you paint it white? I’ve been mildly obsessed with a coastal inspired cuckoo clock for a while now and this has just sent me over the edge! Thanks so much for a great spring tour. 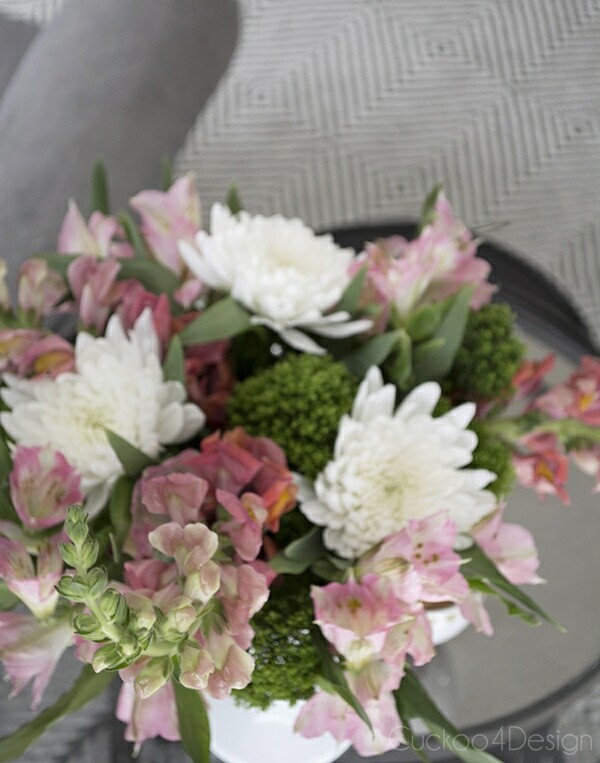 Love your Spring touches Julia! All of your floral arrangements are just breathtaking. Your home is a visual feast for the eyes! Oh hi there Jennifer and thanks so so much! The floral arrangements are just stunning. Of course, I love your whole house (and especially love the kiddos in the pictures!). Your home is gorgeous!! Black and white done oh, so well! 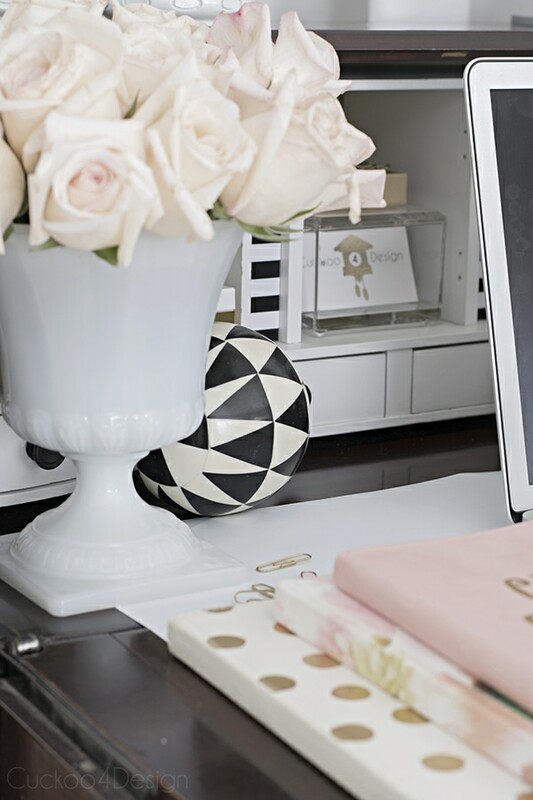 I love, love your workspace…Divine! This is so beautiful! I love your flower arrangements 🙂 gorgeous! Your house is so welcoming. I’m wishing my blogging chair was not the edge of my couch now lol. LOL the edge of your couch 😉 I have my little desk to blog at but I always end up on the chair. It’s the best home office ever. It is so so pretty Julia! I love how you took it more black and white with pops of color! So fresh! 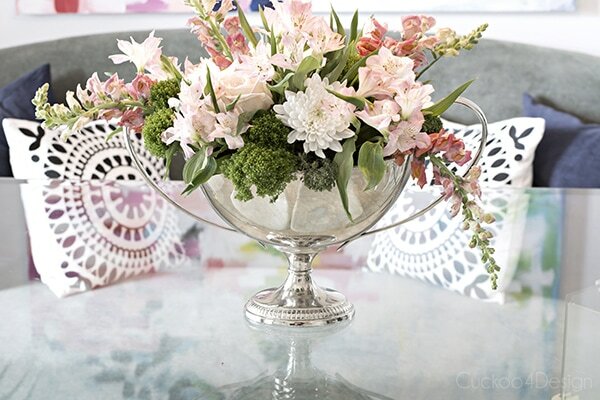 Dang, you have some serious flower arranging skills – your arrangements are beautiful! Your home is so, so stunning – love the light and bright spring look! 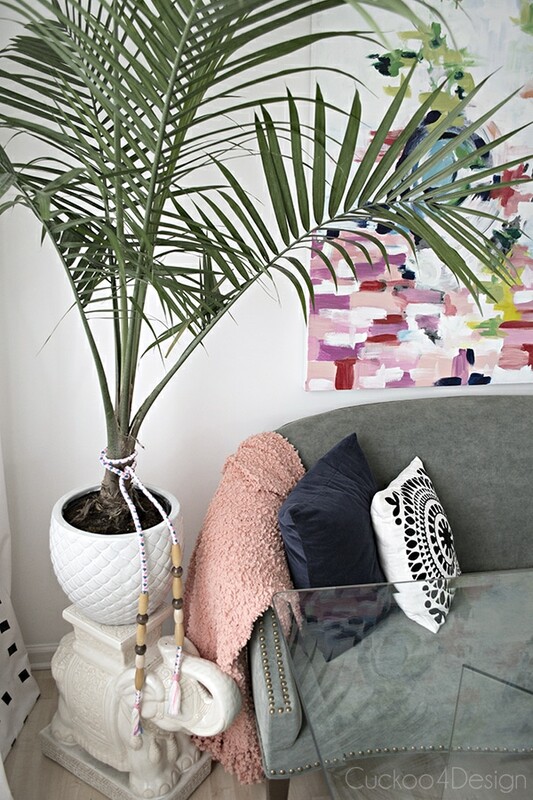 Julia your home is filled with so many pretty and creative touches everywhere, I love how unique and INTERESTING it is! Your vignettes, art, even your textiles are all so fun to look at, I could spend days. 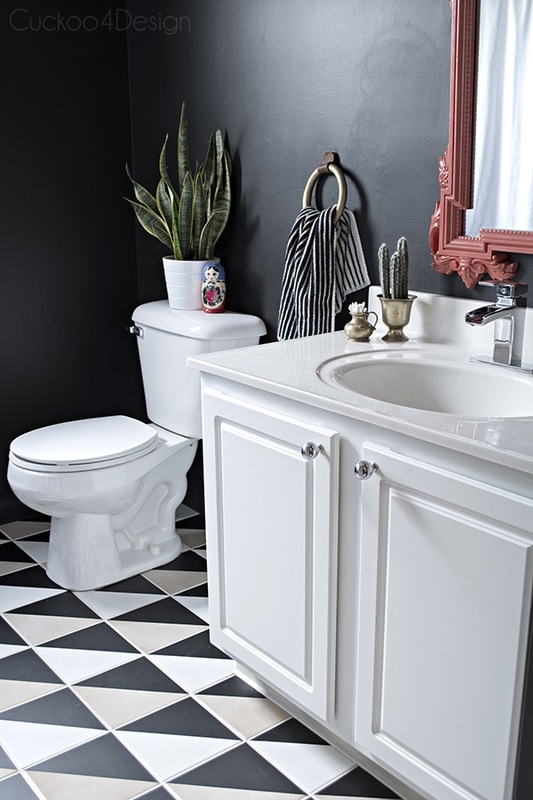 Love the roundup at the end of how you get the look for less! You and your blog are a joy to follow! Thank you Lisa, your comments always make my head bigger 😉 You are so sweet. Wow, Julia!! Your dining room is amazing! 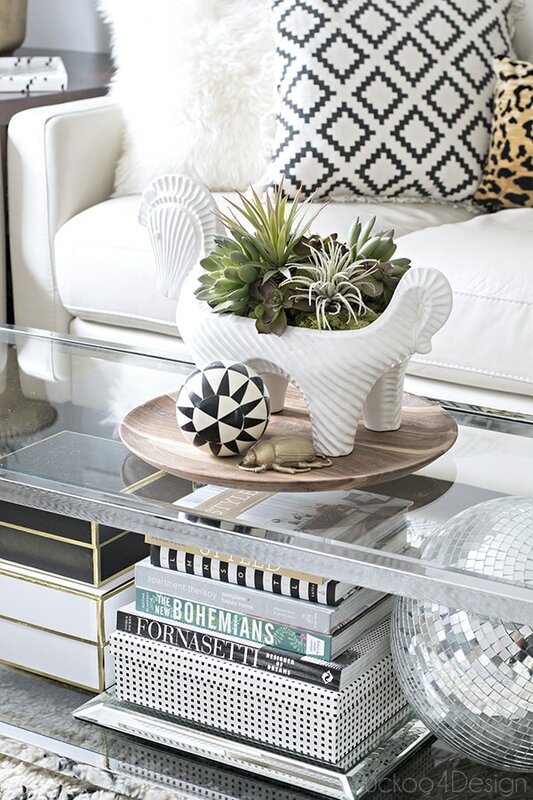 Every inch of your home is so chic and stylish! You’re SO talented, artist, photographer, designer, and now floral arranger!! Oh my gosh Pam, thanks so much for your sweet words! Oh , how I love your style – this was a wonderful tour!! 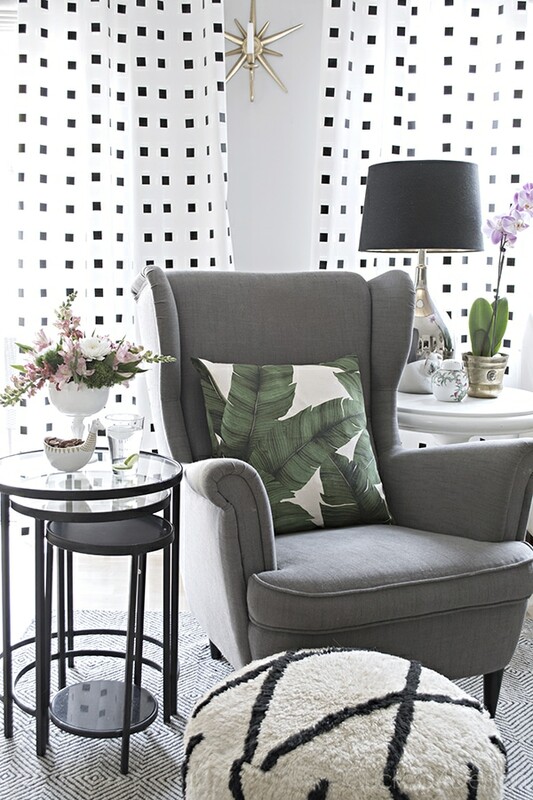 I can’t thank you enough for providing links to all of your decor (wish more bloggers did) – I have already purchased several items and am planning on going to Ikea tomorrow to pick up the gray chair – it’s just what I have been looking for, and the price is great! Thank you again for a great post! I’m so glad you like it. Make sure to check on Ikea’s website first that they actually have the chair in stock. I can’t tell you how many times I’ve went there and they didn’t have what I wanted to buy, this chair included. I love my Strandmon chair though. So comfy and like you said the price is awesome. Yay! I spotted someone else with a gnome in their decor! Loved everything, Julia! Stunning! Stunning and so beautiful as always, Julia! I have that same elephant garden stool that your palm is on… love him (he got painted of course, though!). 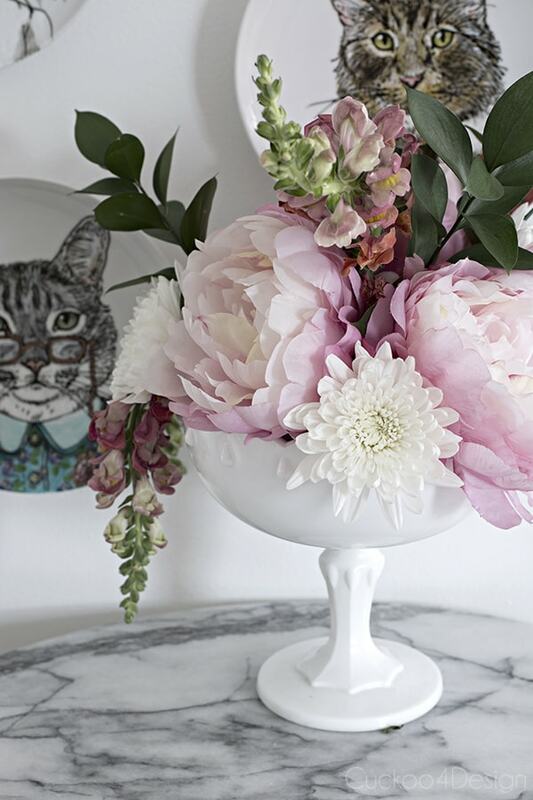 I would have never guessed those peonies were faux, even close up. You did such a wonderful job on your flower arrangements! I can swoon over your home all day long! 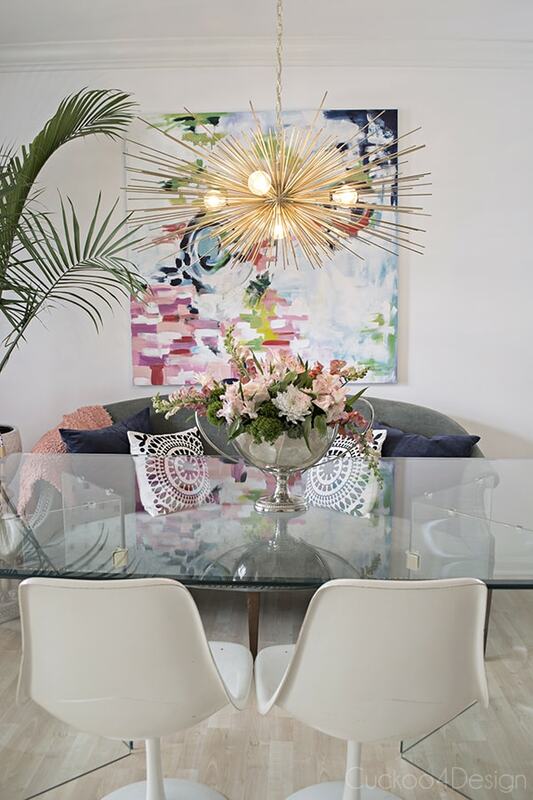 Everything looks simply devine. .
All those blush and light colors make your home really pop even more! It looks fabulous! 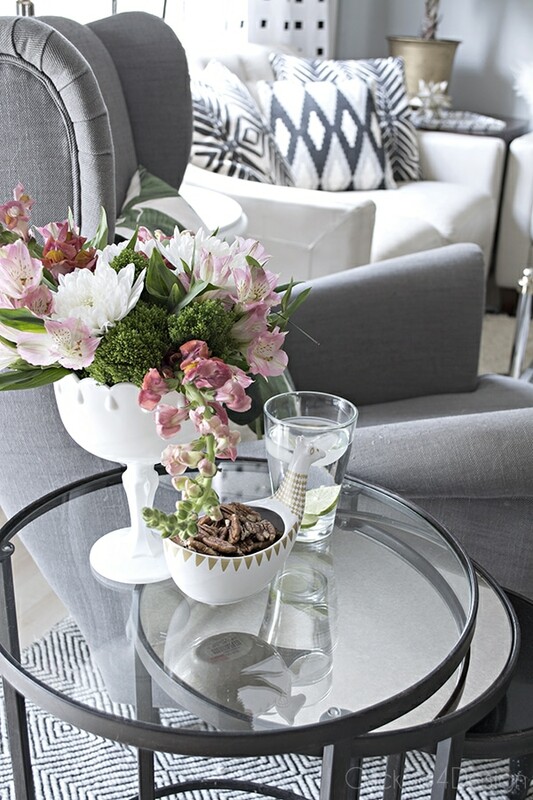 Everything always looks so fresh and bright in your house that it doesn’t need much extra for spring :). All the flowers are gorgeous!! I love all of your creative ideas Julia! 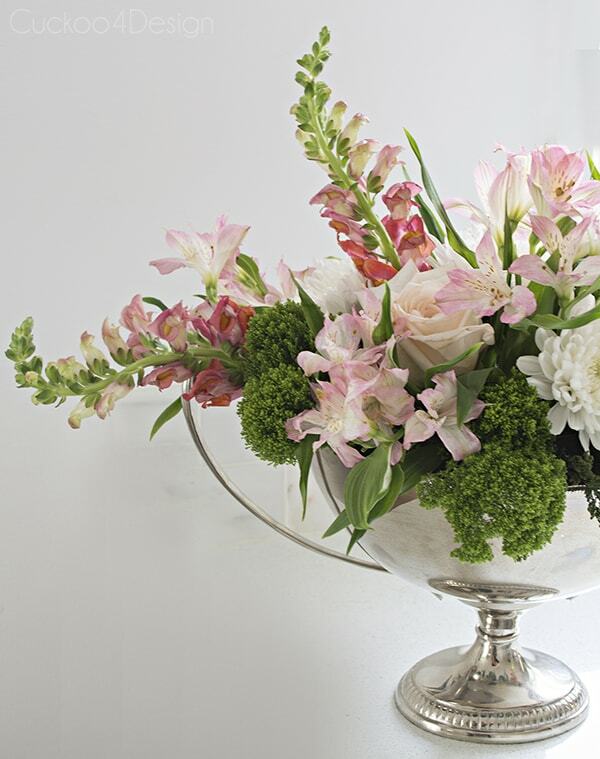 Your floral arrangements are gorgeous! I just ordered those leopard pillows…CANNOT WAIT to get them! 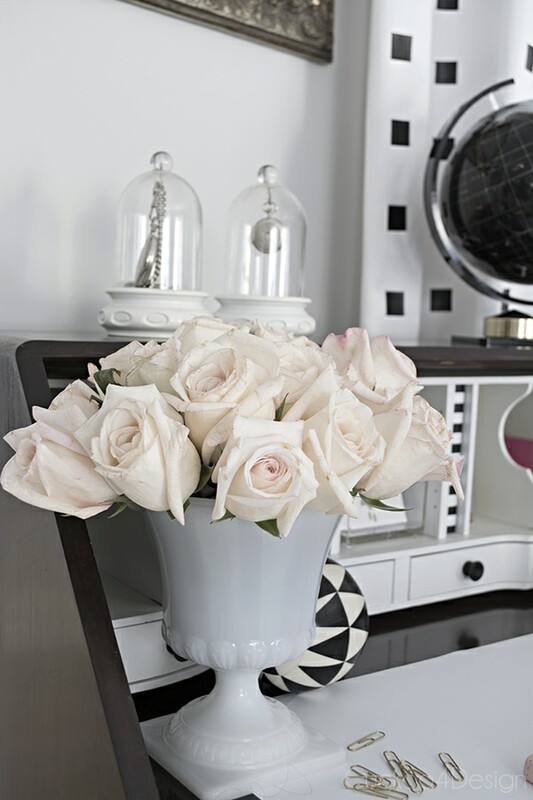 They look so fabulous in your home! Julia, those different pinks really make everything pop; I love it! Wow, Julia! Everything is so elegant! I love it! Your home is absolutely stunning, sweet friend! 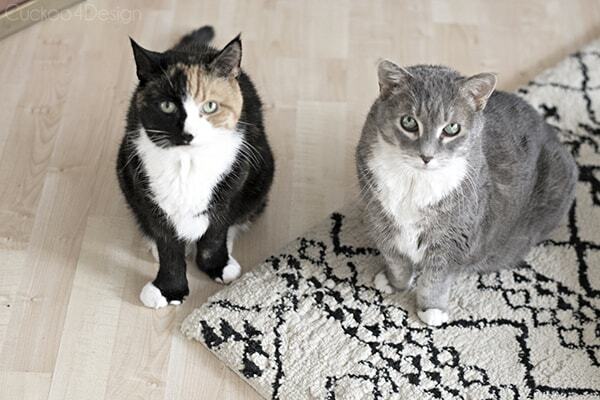 I love the changes in your bedroom, especially that black and white pillow! And your dining room is so lovely! That light fixture was such a gorgeous addition to it! Your house is lovey, thanks for sharing. 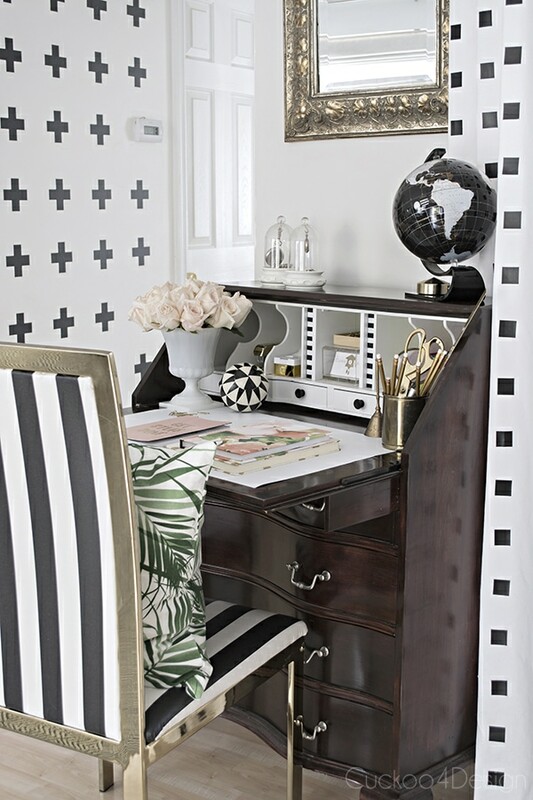 I love your room, and your desk is just stunning! I love how you decorated your home and all the furniture pieces are pretty. Especially your night stands! Where can I find them or any similar ones that you know of? Your home is gorgeous! I am starting to decorate my soon to be home and your style is exactly what I am going for. Thanks for the inspiration! 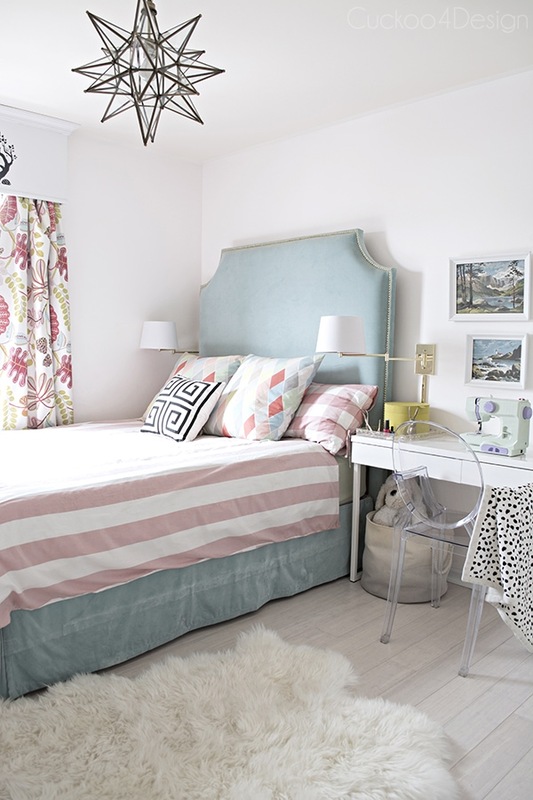 Where is your duvet cover/comforter in your master bedroom from? And the pillows?! Love your style! 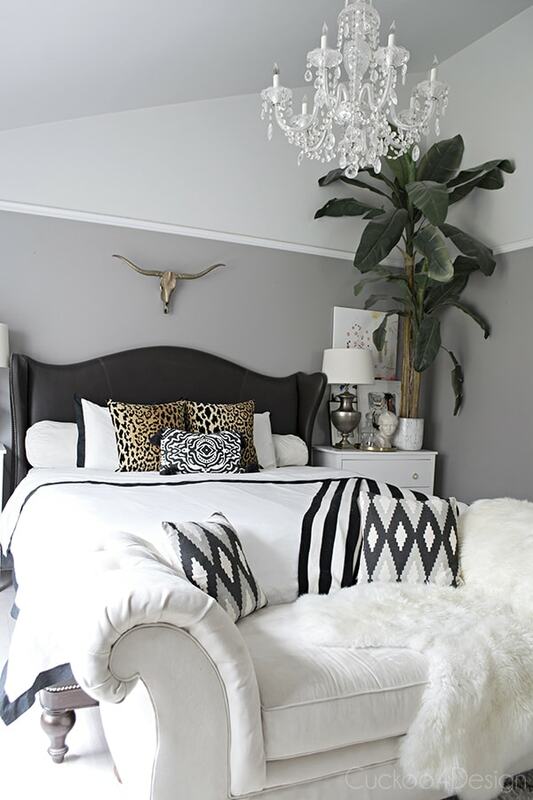 What is your paint color in your bedroom?